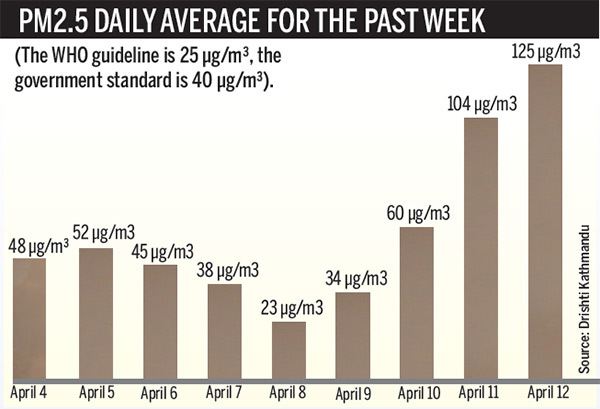 With air quality deteriorating and levels of fine particulate matter (PM 2.5) increasing by the weeks, Kathmandu pollution crisis is on the verge of becoming the new capital punishment for Valley denizens. There has been widespread criticism from different quarters of the government’s apathy towards addressing the crisis, while many have come out on the streets to raise awareness about the rising pollution levels and demand immediate measures to tackle the problem. On Thursday, a group of 15 students wrapped themselves in plastic sheets with ropes wound around their necks and stood at Tinkune, one of the busiest thoroughfares of the Capital, offering quite a sight to passers-by and commuters alike. They had but one aim: Drawing the attention of the authorities to pollution crisis. “All of us in the Capital are facing a hard time breathing these days. But we can do nothing. So we are huddled here wrapped in plastic sheets and ropes wound around necks, in an indication how we are choked and our lungs are constricted by the air we breathe,” said Tanka Chaulagain, who choreographed the act. The students are from Kantipur Film Academy. Kathmandu’s deteriorating air quality has become a major cause for concern of late. pollutants that penetrate deep into the lungs and into the cardiovascular system, posing the greatest risks to human health. The recently installed air quality monitoring system on the US Embassy’s Phora Durbar premises measures the PM2.5 by converting it into an Air Quality Index (AQI). The AQI is measured on a scale of 0 to 500, with 500 being the most hazardous. On Thursday at 4pm, the AQI value for Phora Durbar stood at 229, which is classified as very unhealthy. The AQI on Tuesday (April 11) at 8pm was 204--one of the worst AQI among all US State Department’s installed monitoring systems in the region. New Delhi, for example, had a value of 126, Kolkata 178 and Dhaka had 175 the same day. The students said they are planning more pollution-related performance art in the future, if the issue remains unresolved.